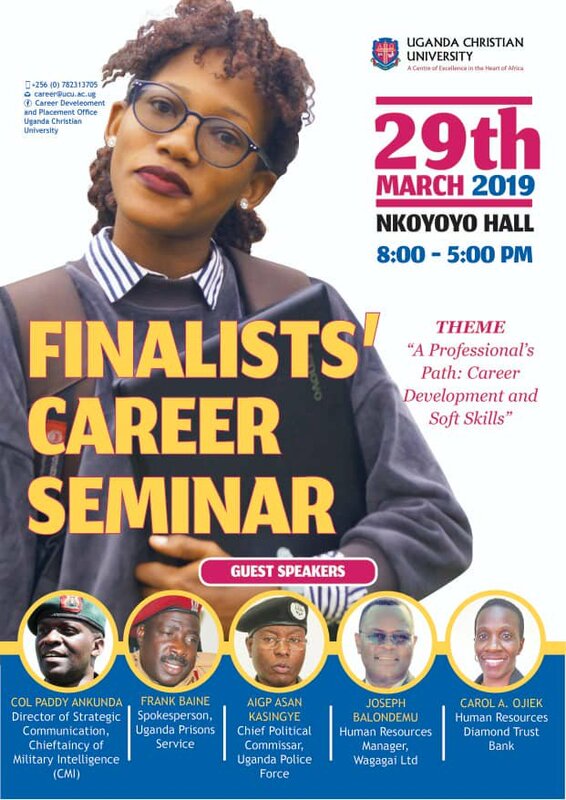 As their academic marathon comes to an end, Uganda Christian University, Mukono deemed it wise to treat this year’s finalists with a Career Seminar. Amongst the distinguished guest speakers as per the schedule are AIGP Asan Kasingye, Uganda Prisons Service Spokesperson Frank Baine, Col. Paddy Ankunda – Director of Strategic Communication Chieftaincy of CMI, Joseph Balondemu – Human Resource Manager at Wagagai Ltd. and Carol Ojiek Human Resource Manager at Diamond Trust Bank. These key speakers are expected to engage the student fraternity in a fruitful deliberation on what it takes to achieve one’s career goals and expectations under the theme “A Professional’s Path: Career Development and Soft Skills”. One would expect that basing on the composition of the Quorum for this seminar, many will also be encouraged to join or enrol to serve in the various Security Forces of this nation. This seminar is expected to take place on 29th March 2019 in Nkoyoyo Hall (UCU Main Campus) from 8am – 5pm.